386 - Incentives and Rewards: Lazy or Excellent Management? Greetings everyone, this podcast recorded while in Concan, TX. I’d like to share an article I wrote that was published in OH&S Magazine. The published article can either be found on the magazine’s website or under Insights at www.ProActSafety.com. A client recently emailed me about a celebration his organization had held to recognize the workforce for reaching a “milestone in their progress towards safety excellence.” I asked if the “milestone” was something identified on their road map to safety excellence. After some hesitation he admitted that it was not on the road map but that they had recognized a significant achievement that they believed would be sustainable and wanted to celebrate it. There is nothing inherently wrong with looking backwards and realizing you have accomplished something worthwhile, but there is a missed opportunity. Mapping out a journey and identifying milestones in advance does not detract from the satisfaction of reaching them. In fact, it reinforces the feelings because there was a clear plan to get there and accomplishing the goal is even more satisfying than accidentally realizing success. Clarity of purpose and direction creates milestones in the road ahead and not just in the rear-view mirror. Visible progress toward goals is one of the cheapest and most effective motivators available. Use it deliberately, communicate your progress continuously, celebrate successes earnestly and motivate your workforce toward safety excellence relentlessly. Greetings everyone, this podcast recorded while in my home in TX. I’d like to share an article Terry Mathis wrote, published September 2013 in IndustryWeek Magazine. The published article can either be found on the magazine’s website or under Insights at www.ProActSafety.com. As more and more leaders and safety professionals realize the limitations of reactive safety, they search for leading indicators to help them manage safety more proactively. This thinking fueled the concept that lagging indicators alone, are not truly representative of safety performance, nor are they predictive or prescriptive. The first round of so-called “leading indicators” was little more than a measurement of safety-related activities: hours of safety training, attendance at safety meetings, participation in safety programs, etc. OSHA’s crackdown on incentives that could potentially suppress reporting of accidents drove many organizations to base their incentives on these activity metrics rather than simply not having an accident. When behavior-based safety became the rage, the measurement of behaviors from observations came to be thought of as a leading indicator. As safety culture became a buzz phrase, perception surveys gained in popularity and came to be considered another potential leading indicator. The search for meaningful leading indicators goes on because no one of these has proven adequate in predicting and preventing injuries. Where none of these alone succeed, all of them together potentially can. A balanced-scorecard approach in which the metrics not only complement, but predict each other has proven quite effective in proactively predicting how to prevent accidents. When you measure how much activity it takes to change perceptions, how much of a change in perceptions it takes to change behaviors, and how much behavior change it takes to change the lagging indicators, you begin to truly measure the effectiveness of safety efforts. Just as balanced scorecards have revolutionized strategic management, with our most successful clients, balanced scorecards for safety have proven to have a transformational impact on safety management. How balanced are your measurements? Many efforts for improving safety performance include rewards or incentives. While the theory of incentivizing safety is well intentioned, the practice varies from effective, to ineffective, to harmful. Additionally, there are many new discoveries about how incentives and rewards really work and new thinking on how to best use them. If you already have a program of rewards or incentives for safety in place, don't suddenly stop it. This can do more damage than good. The best approach is to transition your existing program into a more effective program over time. The correct use of motivational strategies for safety is critical to the accomplishment of safety excellence in any organization. If you are like many companies, you have probably experienced widely differing results with many of the off-the-shelf programs available. Consolidating these various strategies into a coherent and effective set of best practices is becoming increasingly important because of the tendency of incentive programs to either fail or go horribly wrong. Some incentive programs have simply become a waste of resources because they have not improved motivation or performance. Others have done serious harm to the safety culture, to safety results, and to relationships with represented workforces. Avoiding these problems is possible by following some basic guidelines which is well worth the effort in terms of results. Improvements in the effectiveness of safety motivational programs is possible regardless of whether you have existing programs, past attempts, or have never tried. The guidelines shared in the workshop are designed to help make the best use of safety motivational strategies. For more detailed strategies to achieve and sustain excellence in performance and culture, pick up a copy of our book, STEPS to Safety Culture Excellence, available through WILEY (publisher), Amazon or Barnes and Noble. 246 - Safety Motivation: Hands and Feet, or Hearts and Minds? Greetings, this podcast recorded while in Bethesda, Maryland. For the podcast this week I’d like to share an article I wrote that was published in April 2012 in my column in BIC Magazine. It was titled, Safety Motivation: Hands and Feet, or Hearts and Minds? The published article can either be found at www.BICAlliance.com or under Insights at www.ProActSafety.com. I hope you enjoy the podcast this week. 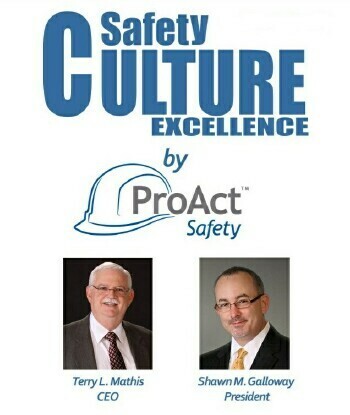 If you would like to download or play on demand our other podcasts, please visit the ProAct Safety’s podcast website at: www.safetycultureexcellence.com. If you would like access to archived podcasts (older than 90 days – dating back to January 2008) please visit www.ProActSafety.com/Store. Greetings everyone, I wanted to share with you a new workshop we have created to help you further improve your safety culture and performance and achieve safety culture excellence. To see the currently scheduled dates and locations around the world, please visit www.proactsafety.com and click on the events tab. If you would like information on a private workshop, seminar, keynote speech or consulting, contact us at info @ proactsafety.com This particular workshop is titled: Incentives, Rewards & Recognition: What To Do and What Not To Do. Greetings, this podcast was recorded while working in Topeka, Kansas. This week I’d like to share an article I wrote that was published in July 2011 in my column in COS Magazine, it was titled, “Public Praise and the Dangers of Demotivation”. The article can either be found by visiting the magazine’s website at www.COS-MAG.com or under Insights at www.ProActSafety.com. 184 - Incentives and Rewards: Lazy and Criminal, or Excellent Management? The following is from a 1993 HBR Article titled: Rethinking Rewards: “In fact, we believe our incentive compensation program is at the heart of our company’s success… Since we adopted this approach, the quality of the budgeting process has substantially improved. Finally, award opportunities are uncapped, and, as a result, they encourage the entrepreneurial spirit that we value. When designed effectively and integrated thoroughly into the management process, executive incentive programs work well for management and shareholders alike.” L. Dennis Kozlowski (Former Chairman and CEO of Tyco Laboratories and now residing in a New York Correctional Facility for financial crimes). If a site were to imagine what safety excellence looks like, what role do incentives play? I would not define safety culture excellence by what we have to do to prompt desirable behavior. Excellence to me looks like a naturally occurring series of desirable behaviors that occur unprompted. I prefer approaches that inspire people to do things above and beyond what is required for the right reasons, and recognize them for then doing more than what is expected for their job. Often positive reinforcement (R+) is sufficient. Managers can certainly reward the individual behaviors, nothing wrong with recognizing behaviors that helped achieve a result. I agree with that. I just want to ensure people are performing these desirable behaviors for the right reason, not the reward. If an organization cannot afford to pay their reward program and if the behaviors are not occurring for intrinsic reasons, they will often cease. I choose to set goals, inspire, coach, recognize and then lead by not leading. When people see progress and are recognized for their individual efforts, you have developed a sustainable model for performance. Telling them if you do this, I’ll give you that and then no longer can, isn’t sustainable. It should be recognized that we all are trying to develop paths to the same goal: Creating a world safe and free from risks and a society that knows the precautions necessary to keep themselves injury and disease-free. Both I believe can only be sustainable through an intrinsic passion for excellence, and the right combination of tools. Incentives can certainly be a starting point; they just shouldn’t be the ending one. If this is a site’s ending point, than they aren’t there yet. Incentives and Rewards: Lazy and Criminal, or Excellent Management?